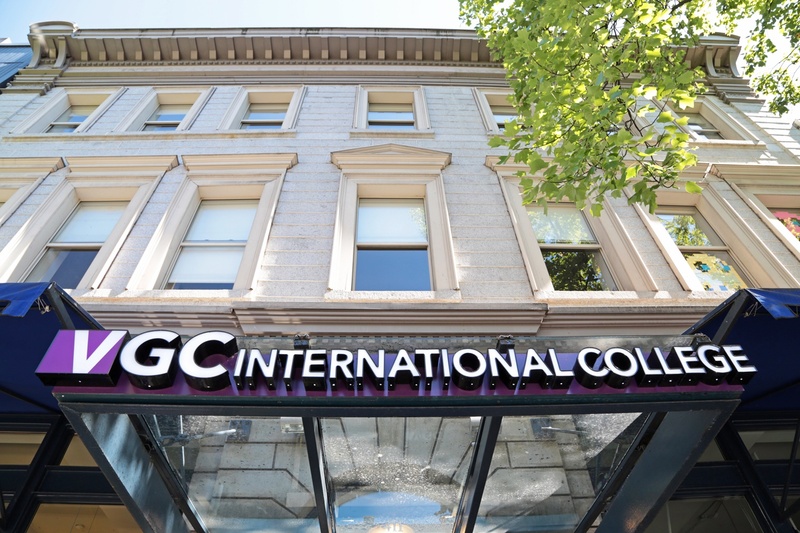 VGC International College’s School of English Language is recognized by thousands of students from all over the world, as well as prestigious post-secondary institutions, as the premier English language school in Vancouver, Canada. VGC International College’s School of International Business programs are designed for Canadian and international students seeking a foundation in business fundamentals. Ideal for individuals planning to pursue further studies as well as working professionals. VGC International College holds pathway agreements with universities and colleges in North America that allow seamless entry without having to write the TOEFL test or IELTS test after graduating from their English programs. VGC is amazing!! I highly recommend them to anyone who needs to improve their English. University Preparation is challenging and incredible. Their teachers and team are strongly prepared and we are always learning something new. They provide us different activities to socialize and practice our English out of class. I loved studying there. Good teacher and good class.It was very exciting time in VGC. I had a wonderful experience studying at VGC. I changed of program three times because I wanted to try different things and the three of them were amazing. My first three weeks I was in the summer camp and I met a lot of people there. I had a lot of fun and we visited many different places, like the Rocky Mountains, Whistler, Deep Cove… I also went rafting, played hockey and many other things! After the first three weeks I went to Global English, which was very interesting too, we had optional activities every afternoon and on Mondays and Wednesdays we had elective class (you can choose between many options and it helps you improve the topics you need to work harder on..I was in Global English for three weeks and my last week I decided to change to TOEFL, even though I don’t want to take the TOEFL exam. It was nice because the methods were different from Global English and I wanted to try more things before coming back to Spain. I also took extra classes (one class more per day) and I learned a lot on that class. All the teachers made the lessons fun and interesting and they were super close with the students, they cared about us. Everyone was super kind to me, I made a lot of friends, had a very good time and when I needed something there was always someone willing to help me. I came here from Spain to learn English and even though I was only 7 weeks I have returned to Madrid with a way higher English level and so happy that I’m already planning on returning next summer! I highly recommend VGC for everyone who wants to learn English, it doesn’t matter if your English level is low or high, you will surely learn a lot. I am a student from Spain and I had joined VGC for one month. I can say a lot of good things about this school but I will summarize them in a few words: VGC is a great and a wonderful place to study English, make friends and enjoy Vancouver's life! I can't be happier! The school's staff is amazing. They are very professional people, with an amazing knowledge in TESL, and always willing to help you, not just academically but also professionally. The school also offers great opportunities to meet different people and experience Vancouver's life by planning all sort of fun activities. Congratulations to VGC for doing such a great job and for trying so hard to fulfill everybody's expectations. I am very impressed and glad for everything you've done! It has been the best month ever! I truly recommend joining the school, no doubts! Thank you! You are a great team VGC! I think this is the best language school in Vancouver. First this is really near by waterfront station so students are easy to go to school. Second, Teachers in VGC are great! They are well behaved and always try to make students happy. Most of them are graduated from prestigous university in Canada and very proficent to teach! Third, Majority of language school in Vancouver such as ISLAC and VCC is not really concentrate studying but VGC has a good balance between activity and academic study. I highly recommend to join VGC's English programs. 'The place where has good activity and can enjoy to study!' ---------------------------------------------------------------------------------------------------솔직히 벤쿠버에서 제일 좋은 어학원이라고 생각합니다. 워터프론트 역에서 가까워서 학원 찾는데도 무리가 없고 선생님들 전부 친절하고 무엇보다 굉장히 열정적 이십니다. 당연히 수업도 잘가르켜 주십니다. 선생님들 대부분 캐나다에서 UBC 나 Mcgill Western ontario, Uvic 같은 명문대에서 공부하신 분들이고요. 벤쿠버 다운타운 어학원이 사실 거의놀자판 인데 비해서 여기는 아카데믹함과 엑티비티가 잘 조화를 이루는 곳입니다. 솔직히 유학원이 여기가 좋다 여기가 좋다 이래서 저도 많이 알아봤는데 여기가 제일 좋습니다. 친구 사귀기도 굉장히 쉽고, '잘놀고 잘 공부할수 있는곳' 강추합니다. If you are looking for a professional, reliable and serious English Langague School, highly qualified and skilled English teachers, warm and attentive staff always available to help you and give you the best advice according to your need, well organized programs, clean-room classes, various interesting activities specialy planned for VGC students, VGC is the best place in Vancouver for that. I recommend you to visit the school, talk to the marketer speaking your native language and event have a trial lesson. You will improve efficiently your fluency and accuracy in English and gain self confidence. VGC gave me really precious and amazing time and experiences. They always try to make students feel comfortable and be ambitious for learning more. All classes that I took are helpful and very practical even after graduating. In addition, apart from the class, VGC's activities were awesome!! Especially, the talent show was the most outstanding and unforgettable one! If you have any talent, you must show yourself at the talent show!! Anyway, thank you for everything. I LOVE VGC. If you are looking for an educational establishment that is forward thinking, creative and caring then VGC is the place to go. I completed the TESL Diploma and it was an incredible experience. The staff at VGC genuinely care about providing top quality ESL teaching. As a native speaker from the UK I completed the Teaching diploma and I felt that the teachers adapted their methodology to meet my needs. There is a real sense of belonging when you walk into the building and the strong rapport between teachers and students resonates through the constant buzz of learning coming from the classrooms. I wish all staff and students every success for the future. It was an absolute pleasure being part of the VGC family. VGC has done almost impossible for me. For 4 months at this school, I was able to learn how to write essays and get pleasure from it, do not be afraid to speak English, start to think in English, catch the melody and beauty of pronunciation of English in its Canadian version, and most importantly pass the university exam and be there accepted! Thank you Jass that taught me to treat IELTS as a routine, since the training of putting it out every two weeks is so boring that involuntarily I began to feel during his surrender as if I was just cooking in my kitchen. Thanks to Kristina for such a childish happiness to see the world happy and hopeful and forget in the lessons that I'm learning English and that he is not my native language. And keep in mind that this is not the most expensive school in Vancouver, and if you are like me going to study for more than two months, then be ready to save a decent amount of money because the school provides a solid benefit. By the way, this year I lower my taxes as the school issues a special check form, which is not done by every English school. Thanks to all the wonderful VGC team. I've studied at VGC for about 7 months. It has been an unforgettable experience in my life.VGC is one of the best schools in Vancouver. They offer you a good opportunity to improve your English, and for sure you will be able to gain a great deal of knowledge in your class. After class, VGC provides Study lab where a teacher is available and you can ask questions individually. It was really helpful to me, especially before an exam. Theachers and stuff are amazing. Everyone is so kind!! I will miss them:-( And, of course, activities the school organizes are awesome! It's various and all of those are cheaper. I highly recommend VGC!!!!!! !